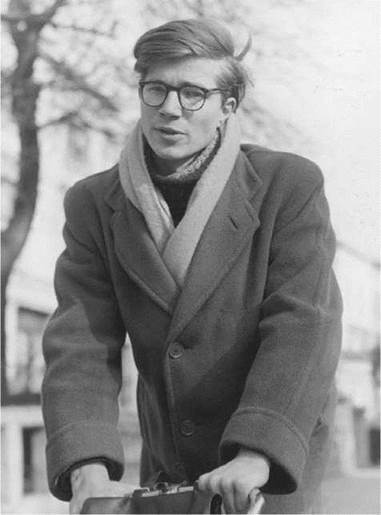 Colin Wilson shot to fame in 1956 with his first book, The Outsider, a lively and wide-ranging survey of social and spiritual alienation. The book quickly became a best seller in Britain and the United States and made its previously unknown author, a self-educated twenty- four-year-old from the English Midlands, into an international celebrity. But Wilson soon fell from grace, and critics savaged his second book, Religion and the Rebel (1957). Since then, however, he has produced more than one hundred books on topics such as philosophy, psychology, literature, murder, sexuality, and the occult. Eclectic Early Years. Colin Henry Wilson was the first child of Arthur Wilson, a boot and shoe salesman, and Annetta Jones Wilson. Although he learned to read relatively late (at age seven) and only read a weekly comic until he was ten, he started to read more widely at that age, consuming thrillers, science fiction, true crime, romance magazines, and books of science. In his early teens he picked up the classics of English literature. This eclectic mix of reading material was later mirrored by Wilson’s wide-ranging choice of subjects to cover in his works. At age eleven, he won a place at the Gateway Secondary Technical School in Leicester, and while he was not an outstanding pupil, he further developed his interests in science and writing. After a brief stint in the Royal Air Force, Wilson went back to Leicester. He worked at a fairground, at building sites, and on a farm. He then went to Paris for three months. Returning to Leicester, he took an office job in a factory, where he met the company nurse Betty Dorothy Troop, whom he married in June 1951. They moved to London, where their son Roderick was born. Wilson continued to work on a novel, for which he now had ambitious plans: As he wrote in Voyage to a Beginning, ‘‘[i]t was to possess the power of Crime and Punishment, and the length and technical complexity of Ulysses.’ He would use the Egyptian Book of the Dead for a design, as James Joyce had used the Odyssey for the design of his novel Ulysses. But life in London was often difficult. Wilson went through eighteen months of factory jobs and periods on unemployment benefits, moving frequently; finally, his wife moved back to Leicester, and the marriage effectively came to an end. Having finished the first part of his novel, he decided to dash off an account of his own ideas; this account became The Outsider and changed his life. Such abuse might have broken some writers, but as writer Hilary Corke observed, ‘‘Wilson turned out to be a much tougher egg.’’ The notion that he was destined for recognition had sustained him since the time before he was published. While still in his early teens he had begun to feel superior to the ‘‘vegetable mediocrity’’ of his working-class Leicester background. After settling down in Cornwall, he remained there, apart from lecture tours of the United States in 1961 and of Japan and Australia in 1986 and periods as a visiting professor at various universities. Issac Asimov (1920-1992): One of the most prolific writers of all time, having written or edited more than five hundred books on a wide array of subjects, especially science and science fiction. Tom Wolfe (1931-): A best-selling American author and journalist who was a founder of the New Journalism movement of the 1960s and 1970s. The Beatles (1957-1969): A rock group from Liverpool, England—featuring Paul McCartney, John Lennon, Ringo Starr, and George Harrison—that became one of the most commercially successful and critically acclaimed bands in the history of popular music. John Kennedy (1917-1963): President of the United States from 1961 until his assassination in 1963. He was the initiator of the Peace Corps and the Apollo space program, and the figurehead (alongside his wife Jackie) of an era that came to be called "Camelot." Neil Armstrong (1930-): A former American astronaut, test pilot, university professor, and naval aviator. He was the first person to set foot on the Moon. The Prelude (1805, revised in 1850), a poem by William Wordsworth. This long narrative poem focuses on the importance for an artist of sensitivity, memory, and the powers of imagination. ''A Theory of Human Motivation" (1943), a paper by Abraham Maslow. For this influential psychology paper, Maslow studied remarkable people such as Albert Einstein, Frederick Douglass, and Eleanor Roosevelt to determine what makes a person fully ''self-actualized,'' or able to reach their maximum potential. The Electric Kool-Aid Acid Test (1968), a nonfiction work by Tom Wolfe. In this pioneering work of ''New Journalism," Wolfe followed the author Ken Kesey and his group of ''Merry Pranksters" as they drove around the country in a painted school bus following the band the Grateful Dead and philosophizing about what they considered to be spiritual and philosophic insights through the regular use of LSD and other hallucinogenic drugs. In the Buddha's Words: An Anthology of Discourses from the Pali Canon (2005), a philosophical work edited by Bhikkhu Bodhi with a foreword by the Dalai Lama. An overview of the teachings of Siddhartha Gautama, who lived in India during the fifth and sixth centuries BCE and is recognized by millions around the world as the Supreme Buddha. Wilson has authored over one hundred books, plus many plays and articles, and he supported himself primarily by writing for over four decades. During that time he maintained a high degree of confidence in his talent and ideas, even in the face of severe criticism. Initially, however, critics gave him reason to be confident. His first book, The Outsider, was at first an unqualified success. Only later was there backlash regarding the work and its creator. Wilson has continued, without apology, to make the kinds of claims for his own abilities that helped to arouse such hostility at the time of The Outsider. In his 1986 interview with Diana Cooper-Clarke, while claiming he no longer cared about his literary reputation, he nonetheless said: ‘‘I suspect that I probably am the greatest writer of the twentieth century.’’ This judgment may never be widely shared, but Wilson's novels are a stimulating contribution to postwar fiction, and some of them, especially Ritual in the Dark, are likely to endure. The Outsider. The Outsider was immediately acclaimed in the Sunday newspapers by the two most influential English reviewers of the day, Cyril Connolly and Philip Toynbee. Observer contributor Philip Toynbee called The Outsider ‘‘an exhaustive and luminously intelligent study of a representative theme of our time ... truly astounding ...a real contribution to an understanding of our deepest predicament.'' Other reviewers offered similar praise, and the book achieved best-seller status in both England and the United States. 1. Wilson has written fiction, philosophy, true crime stories, books about the occult, and other topics. Do you think it is possible to write equally well on a wide range of subjects and in different styles? Can you think of any examples of an author who does this? 2. If Wilson had never written The Outsider, or if he had written it or some of his other books under a different name, do you think the criticism of his later novels would have been so harsh? Why or why not? Do you think it is fair for a critic to judge a writer’s work by what he or she says and does outside the work, as well as the content inside? 3. Which, if any, of Wilson's characters live up to the ideals he valued in the real world of the human mind's realizing its full potential? 4. Wilson wrote about the Kabbalah, a brand of Jewish mysticism, which has received much recent attention from singer Madonna and actress Demi Moore. Using your library and the Internet, find out more about the Kabbalah and write a paper summarizing your findings. Allsop, Kenneth. The Angry Decade: A Survey of the Cultural Revolt of the Nineteen-Fifties. Wendover, England: Goodchild, 1985. Bendau, Clifford P. The Outsider and Beyond. San Bernardino, Calif.: Borgo Press, 1979. Bergstrom, K. Gunnar. An Odyssey to Freedom: Four Themes in Colin Wilson’s Novels. Uppsala, Sweden: University of Uppsala Press, 1983. Campion, Sidney. The World of Colin Wilson: A Biographical Study. London: Muller, 1962. Dossor, Howard F. Colin Wilson: The Man and His Mind. Shaftesbury, England: Element, 1990. Stanley, Colin, ed. Colin Wilson, a Celebration: Essays and Recollections. London: Woolf, 1988. Tredell, Nicolas. The Novels of Colin Wilson. London: Vision, 1982. Weigel, John A. Colin Wilson. Boston: Twayne, 1975. Colin Wilson World. Retrieved March 10, 2008, from http://colinwilsonworld.co.uk/default.aspx. Last updated on March 10, 2008.